It’s hard to go past fresh figs when they are in season. With it’s creamy mixture, rich pastry and the delicious fresh figs this dessert is hard to pass up on. This Tart would go very well with a great Australian muscat dessert wine of sufficient richness and texture, and compliment your dining experience. To make the crust, combine the flour, sugar, and salt in a food processor and pulse to combine. Add the butter and pulse 4 or 5 times, until the mixture resembles coarse crumbs. In a small bowl, stir together the ice water and egg yolk. Add the egg mixture to the food processor and pulse until the crumbs begin to climb the side of the bowl and hold their shape when pressed together. Unwrap the dough, and using a rolling pin, roll it out on a lightly floured work surface to form a 1cm thick form to fit your tart pan. Working quickly and carefully, line the tart pan with the dough. With your fingertips, make sure that the edge of the tart is smooth and even. Refrigerate it for 20 minutes. Preheat the oven to 180°C. Remove the tart pan from the refrigerator. Line the crust with baking paper, making sure to cover the sides, and fill it with pie weights. Bake for 15 minutes. Rotate the pan and bake for 15 more minutes, or until the sides are somewhat firm and hold their shape. Remove the baking paper and weights and bake for 6 minutes, or until the bottom of the crust looks dry and the shell is a very pale golden colour. Remove the pan from the oven and let the shell cool. To make the filling, beat the mascarpone in the bowl, until smooth, then add the honey and vanilla, and gently mix through. When the crust is cool, spread the filling evenly in the bottom. 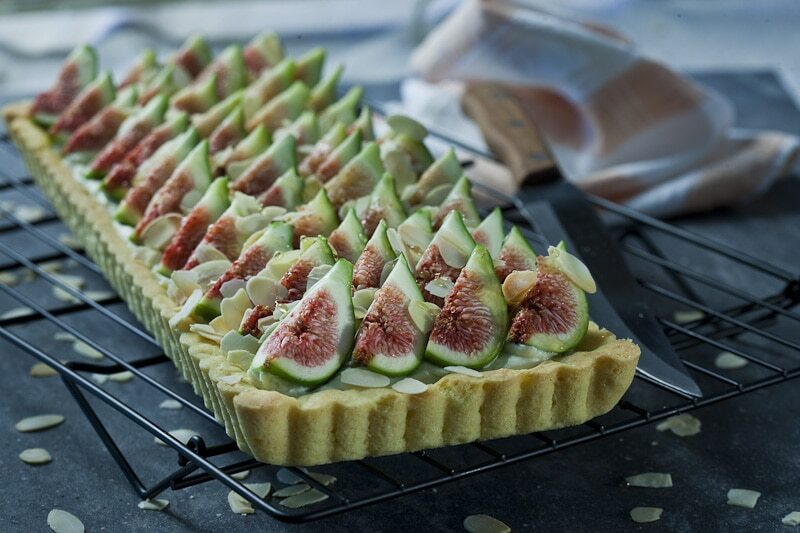 Arrange the figs, cut side up, in a pattern on top of the filling. Sprinkle some toasted almond flakes and maybe a drizzle more honey. The tart will keep in an airtight container in the refrigerator for up to 2 days, but it is best when eaten the same day it is assembled.